Grandi amici 1 corso di italiano per ragazzi A new Italian course for Primary School by Günter Gerngross, Herbert Puchta and Giorgia Rettaroli. 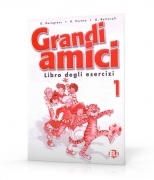 Following the principles of Neurolinguistic Programming and Multiple Intelligences, the activities in Grandi amici encourage pupils to assimilate and memorise the Italian language naturally whilst...more..
Grandi amici 1 Libro degli esercizi The activity book offers lots of activities and supplementary games that can be completed at school or at home. 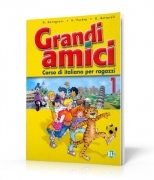 G. Gerngross, H. Puchta, G....more..
Grandi amici 1 CD An audio cd containing the songs, chants, rhyming texts and listening activities accompanies each Student's Book. G. Gerngross, H. Puchta, G. Rettarcoli Length: approx. 60 mins EAN: 9788853609427more..
Grandi amici 1 Guida per l'insegnante The teacher's guide highlights the methodological planning of lessons and offers teachers advice and ideas on how to carry out the activities in the course. 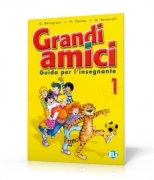 G. Gerngross, H. Puchta, G. Rettarcoli 19,5x26cm 64 pages ISBN: 9788853601476more..
Grandi amici - L'italiano con Tobi la tigre - DVD video The use of the DVD is an appropriate aid for the development of the long term linguistic memory and for the acquisition of a good level of pronunciation and intonation. 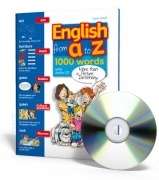 The DVD contains an animated stories based on the Student's book. Classroom experience has shown that pupils...more..
Grandi amici 2 corso di italiano per ragazzi A new Italian course for Primary School by Günter Gerngross, Herbert Puchta and Giorgia Rettaroli. 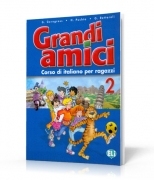 Following the principles of Neurolinguistic Programming and Multiple Intelligences, the activities in Grandi amici encourage pupils to assimilate and memorise the Italian language naturally whilst...more..
Grandi amici 2 Libro degli esercizi The activity book offers lots of activities and supplementary games that can be completed at school or at home. G. Gerngross, H. Puchta, G....more..
Grandi amici 2 CD An audio cd containing the songs, chants, rhyming texts and listening activities accompanies each Student's Book. G. Gerngross, H. Puchta, G. Rettarcoli Length: approx. 60 mins EAN: 9788853609434more..
Grandi amici 2 Guida per l'insegnante The teacher's guide highlights the methodological planning of lessons and offers teachers advice and ideas on how to carry out the activities in the course. 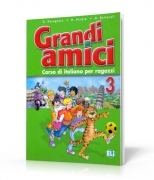 G. Gerngross, H. Puchta, G. Rettarcoli 19,5x26cm 64 pages ISBN:...more..
Grandi amici 3 corso di italiano per ragazzi A new Italian course for Primary School by Günter Gerngross, Herbert Puchta and Giorgia Rettaroli. 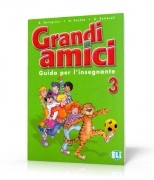 Following the principles of Neurolinguistic Programming and Multiple Intelligences, the activities in Grandi amici encourage pupils to assimilate and memorise the Italian language naturally whilst...more..
Grandi amici 3 Libro degli esercizi The activity book offers lots of activities and supplementary games that can be completed at school or at home. 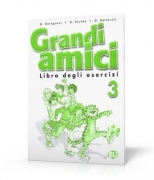 G. Gerngross, H. Puchta, G....more..
Grandi amici 3 CD An audio cd containing the songs, chants, rhyming texts and listening activities accompanies each Student's Book. G. Gerngross, H. Puchta, G. Rettarcoli Length: approx. 60 mins EAN: 9788853609441more..
Grandi amici 3 Guida per l'insegnante The teacher's guide highlights the methodological planning of lessons and offers teachers advice and ideas on how to carry out the activities in the course. G. Gerngross, H. Puchta, G. Rettarcoli more..